“Graphing stories” was terrific early in the year because it didn’t overwhelm kids with each of these steps. I chose and set the scale for one of the two variables; they chose the other. Little if any calculation took place. That lightened the cognitive load for the better. After a little explanation, this was enough direction for most. Both students use my favorite equation, h(t) = -16t2 + vt + y0 , and both decide: “Thanks, but no thanks! Your equation doesn’t give me something that matches reality, so I’ll make my own instead.” On the one hand, I’m thrilled that they are interpreting these graphs, attempting to validate them and after analyzing realizing that the model I gave them is inaccurate. 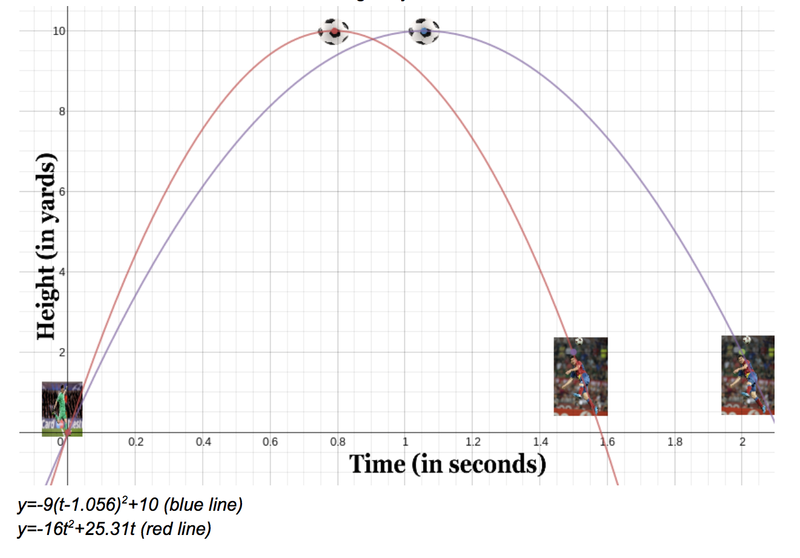 On the other hand… remember the good old days when you could just tell kids that h(t) = -16t2 + vt + y0 would work for projectiles and kids would have to have to really, really care and do a ton of work if they wanted to disprove that? 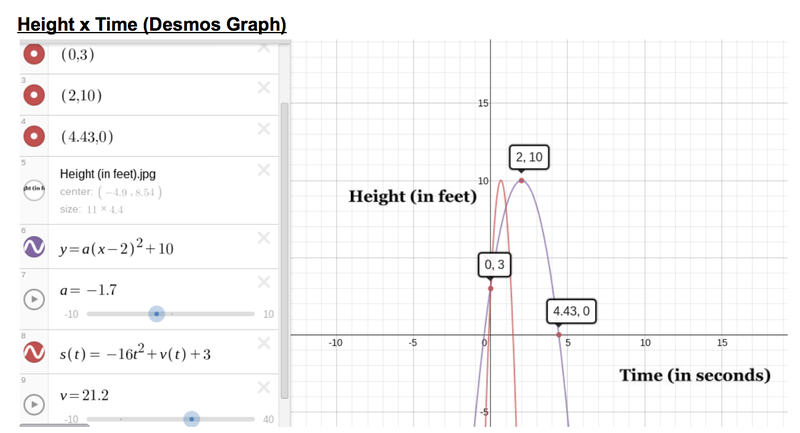 Thanks a lot, Desmos. This is what I’m talking about when I say kids just weren’t satisfied with the tools I had initially provided them to represent the relationships between these three variables. Most students took the route of the samples above and just gave my equation the proverbial finger. As I said, there’s a lot I like about that, and I’m fully content – thrilled, actually – with the work-around that those students chose. But some students pushed this project much further than I could ever imagine. Those results coming up next.